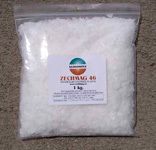 The Magnesium Chloride available in flake form has the highest concentration of actual magnesium. The flake is to be used in either a full bath or in a footbath soak if the full bath is not convenient or not available. This type of transdermal absorption of large quantities of magnesium through the skin is used as an initial cure type of application. If footbath portions of 400-grams are used, a 20-minute footbath soak twice a week together with daily (topical) magnesium old applications will suffice. Available in a case of 12 at a discount. 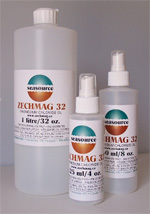 The Zechmag 32 indicates the highest possible concentration of magnesium. Magnesium oil is mainly used for topical applications and/or dealing with specific problem areas, such as skin conditions, sore muscles or joint pains, etc. 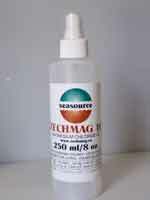 Magnesium oil can be rubbed into the skin like a skin cream or used as a massage oil. If used daily, an 8oz. /250ml bottle should last about a month. Available in a case of 9 at a discount. Available in a case of 4 at a discount. This oil is 16 strength only, which is half of the 32 full strength and should be used by people with very sensitive skin, small children or people with skin conditions or situations where there is broken skin. All prices FOB our warehouse. All taxes extra where applicable. All Canadian customers will be charged 13% HST. Canadian retail orders over $150, free shipping to any address in Canada. No packing or handling fees will be added. Each order will be reviewed individually and we look for the most economical cost of getting the product to you. We will then e-mail you the costs and when shipment has gone out we will provide you with a tracking number from the shipper or mailer. Orders can be picked up from our warehouse and office location in Cookstown, Ontario (just north of Toronto) during regular business hours. All our products are available from us on short notice. We will ship via parcel post anywhere in Canada (or the USA). This will be the most economical way to get the product to you if you buy from us but it will add to your cost. Therefore, we will inform you of any outlet close to you that has our product available for you. Most of these outlets sell at the same price or sometimes at a discount. Please send us an e-mail with your location and we will reply with options to purchase locally if they are available. 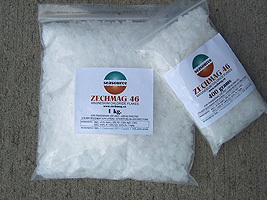 Besides saving the shipping cost, you will also be able to get advice from dedicated and knowledgeable people on the benefits of using ZECHMAG magnesium flakes or oil. We have a growing network of health care professionals and outlets such as health stores, drug stores, wellness and fitness centers, etc. that carry our products. We do not have an auto-ship-policy. If you wish to initiate a program whereby you want to receive our products on a regular basis we will deal with each request individually. All requests for returns must be made within 10 days from the date of receiving your order. The product must be unopened, unused, and in good condition. We reserve the right to deny credit if, upon receipt, the returned merchandise does not meet company return policy requirements. Payment can be made with VISA, MASTERCARD or AMERICAN EXPRES through PAYPAL. We also will accept money orders or cheques, but we will wait until they have cleared the bank before shipping. If orders are picked up from our warehouse or office in Cookstown, we also will accept cash.